Today, two Jerks (get it? Like the Steve Martin film) cover everything and anything you wanted to know about 2017-2018 Broadway season. First, Matt takes you back in time to November of last year, when he covered the Drama League Gala honoring Steve Martin. This was the show’s second time at the Gala, having covered it in 2016 with honoree David Hyde Pierce. Matt spoke with a slew of Broadway luminaries at this year’s event, including Judith Light, Alex Brightman, Jen Colella, Jamie De Roy, and of course the man of the hour, Steve Martin. Martin has a new comedy special with Martin Short, called An Evening You Will Forget for the Rest of Your Life. It is now streaming on Netflix. Next, Matt and up-and-coming New York director Hersh Ellis chat all things Tony season. 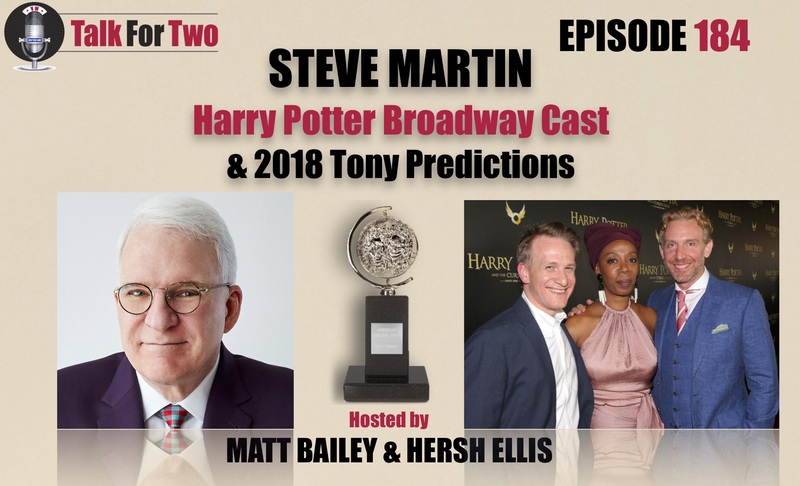 From the surprise nominees, to the possible ‘firsts’ at this year’s ceremony, to even Bruce Springsteen, the pair spend a good chunk of this episode hypothesizing (and hyperbolizing) about what could happen when the Tony Awards air on CBS in just a little over a week. Hersh, a veteran of New York theater at such a young age, has the education and experience to offer some predictions we all would be wise to listen to. Plus, He and Matt discuss Broadway’s hot-button issues like awards show categorizing, and exactly how appropriate it is to ‘stage door’ at your favorite show. And finally, Matt and Hersh share their experience on the red carpet at the Broadway premiere of Harry Potter and the Cursed Child. You’ll hear from Broadway’s Harry, Ron, Hermione, and playwright Jack Thorne. This is a can’t-miss Great White Way wrap-up. Be sure to set your DVRs or tune in to see The 72nd Annual Tony Awards Sunday, June 10th at 8PM EST. For those planning to come to New York, Harry Potter and the Cursed Child is playing at the Lyric Theatre in an open-ended run. Tickets are disappearing like magic! That’s it for Talk for Two until August. Keep tuned right here and on our social media for the latest. And, since we did not get to it in the episode, thanks to season sponsors Axtell Expressions and The Tangent-Bound Network!